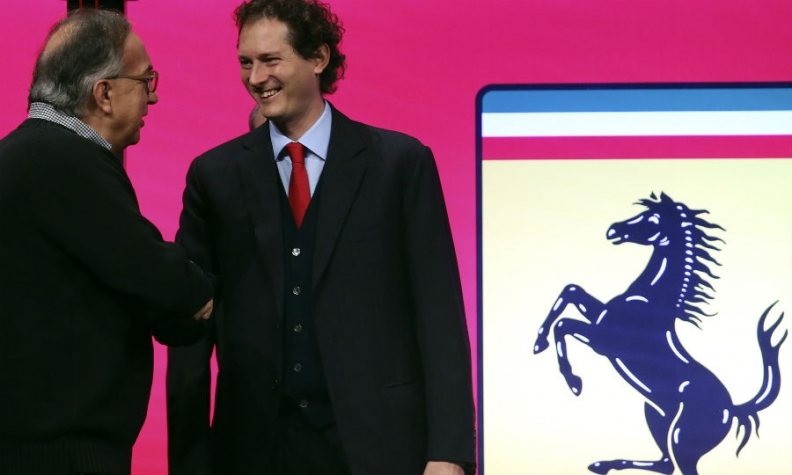 Marchionne (left) talks with Fiat Chrysler Chairman John Elkann during Ferrari's stock exchange debut in Milan today. MILAN (Bloomberg) -- Fiat Chrysler Automobiles CEO Sergio Marchionne is about to find out what it’s like to run the business without the fat profits from Ferrari. Fiat Chrysler on Sunday distributed to shareholders its remaining 80 percent stake in Ferrari. Investors received one Ferrari share for every 10 Fiat Chrysler shares they owned. The supercar maker was listed on the New York Stock Exchange in October and started trading today in Milan as well. Marchionne courted investors in Europe and the U.S. last month to try to convince them that the luxury-car company’s value will increase once it’s no longer part of a mass producer. Still, losing Ferrari’s earnings will put the focus on Marchionne’s ambitious, 48 billion euro ($52.1 billion) revamp of Fiat Chrysler. Slowing demand in China and a drop in Brazil’s car market prompted cutbacks in the plan, with the Alfa Romeo and Maserati divisions putting off new models as the spending emphasis shifts to expanding the Jeep SUV brand. "Investors are worried that the value of Fiat could be much lower without its crown jewel," said Vincenzo Longo, a strategist at IG Group in Milan. Fiat Chrysler rose 1.9 percent to 8.625 euros at 9:04 a.m. in Milan, giving it a market value of 10.9 billion euros. Its market capitalization prior to the Ferrari spinoff was about 16.7 billion euros. Ferrari traded at 42.40 euros, valuing the company at 8 billion euros. Fiat Chrysler was created in the mid-October 2014 merger of Italy-based Fiat and U.S. partner Chrysler Group, and its stock in Milan rose 69 percent between when the Ferrari spinoff was announced two weeks later and its completion Sunday. Fiat Chrysler sold 10 percent of Maranello, Italy-based Ferrari in an initial public offering two months ago. The parent’s remaining 80 percent stake has a market value of about $7.3 billion. Piero Ferrari, the son of founder Enzo Ferrari, owns the last 10 percent. Marchionne, who is also Ferrari’s chairman, has been positioning the supercar manufacturer as a creator of high-end products, rather than as an automaker, to entice stock buyers. Ferrari is valued at 26.5 times estimated 2016 profit, in line with figures for French fashion company Hermes International. By comparison, Fiat Chrysler fetches 8.6 times earnings and General Motors Co. sells for 6.4. The supercar division accounted for 12 percent of Fiat Chrysler’s profit before interest and tax in 2014. Marchionne will now focus on the five-year reorganization of the London-based parent company after GM rebuffed his bid to make the U.S. competitor a partner to share investments. Marchionne, who will give an update of the plan at the end of January, has so far stuck to his 2018 targets, including boosting sales to 7 million cars. That’s almost 2 million more than market researcher IHS Automotive’s estimates for Fiat Chrysler deliveries.